Work Trousers: Warm Working Legs for Cumbrians! We stock a wide range of work trousers suitable for a range of office based professional work and rugged outdoor, heavy duty jobs that many people across Cumbria’s farms and factories are engaged in. You’ll also find a great selection of leisure pants for all sorts of fun and games purposes. At Stitch & Print you will be able to choose from some stylish and practical options for work or leisure. All these trouser styles – in a wide variety of different materials, are customisable with your business or organisation’s logo, including the addition of tax-tags, through our embroidery service. Whether it’s mens’ work trousers or womens’ uniform trousers we can add your company branding to your staff members’ workwear trousers. For a nearly instant quote you can either call us in our Wigton shop or use the contact form via our website . The full range can be viewed in the Stitch & Print web brochure. And remember… we can get your order to any point in Cumbria, the Borders and surrounding areas – within a day of completion of the work. We can serve Ulverston as quickly as Carlisle, so give us a try! In the majority of the Western world trousers have been worn since ancient times, becoming the most popular lower body garment in modern times. Once just a male item, the trouser generally became unisex in the 20th Century when women’s rights improved. Although previously women wore pants for riding, they were covered with a skirt. Many styles of trousers have gone in and out of fashion over the years, such as flares, chinos and jeans. Zip-off trousers and various lengths of cut-off trousers are more recent developments in the trouser history that are stocked at Stitch & Print’s North Cumbria shop and production facility. Stitch & Print understand that it is imperative for your workforce to be comfortable and smart. Whether they are in one of the digital creative offices that have sprung up in Kendal, the transport hubs near Penrith or the submarine works in Barrow we’ve got you covered! In Stitch & Print’s catalogue, you will find a great range of trousers to suit your working needs. 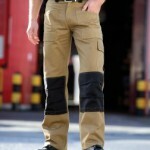 From cargo pants, to hi vis trousers to work trousers with knee pads we can supply your brand. We can also embroider or print them to reflect your branding: making your workforce look even more smart and professional. 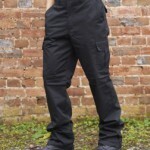 Cargo trousers suit staff in many of the North West’s warehouse and showroom settings. We can supply you with a range of heavy duty work trousers suitable for all UK trades & engineering. We’ve also got the ever popular cargo pant styles, incorporating multiple pocket options, which are being used more and more in warehousing & showroom environments. If the sun decides to come out and play, many of the work trouser styles do come in specialist work shorts format with the same great range of styles & sizes. There’s a range of leg lengths available in much of the range including short & tall versions. You can also find some unhemmed options to complement the standard leg length range. For workplaces that need a smarter look, there’s a range of office wear trousers and smart chino trousers in the most popular workplace colours. Styles are tailored for men and women in a variety of fabrics. There’s a rage of specially designed trousers for work in the hospitality industry, including chefs trousers. There are even trousers designed to accompany our health, beauty & salon wear ranges. Our range of trousers includes some of the most prestigious brands, such as Regatta, Craghoppers, Russell workwear, Premier, Henbury and Dickies. We can embroider these trousers to your specification and want you to end up with the ideal product for your needs, which is why we have such an extensive range. This entry was posted in Trousers, Workwear and tagged borders, Cumbria, embroidered, North West, uniform, work trousers, workwear on 26th February 2015 by admin.